I always know that spring is right around the corner when St. Patrick's Day hits. 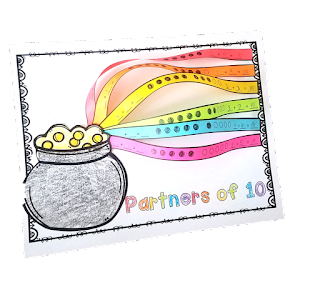 Meet your students and their energy on his holiday with a fun activity that will keep them learning. 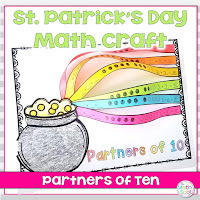 Try one of these 3 St. Patrick's Day math crafts this upcoming holiday season! I like using the cloud for 1, 10 or 100 more or less. These are so colorful and make for a beautiful spring bulletin board! 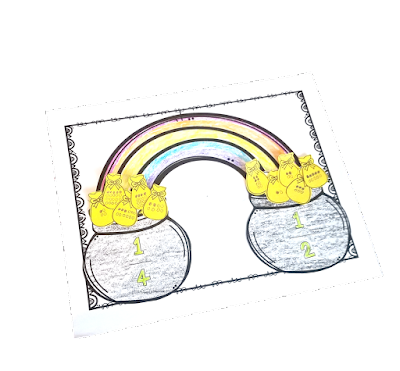 This activity is perfect for a kindergarten or first grade class. Before creating the craft, make an anchor chart showing all of the combinations of 10. 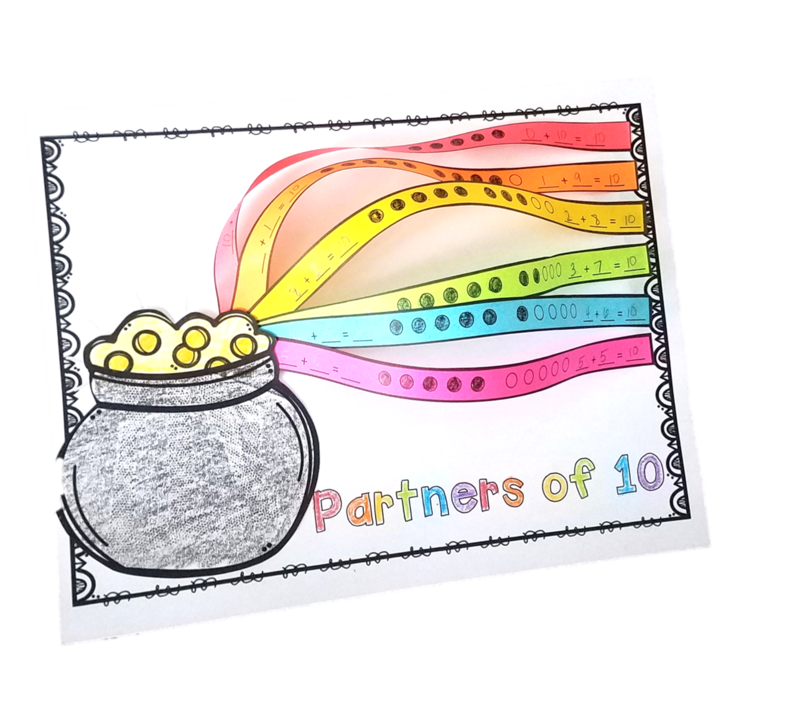 On strips of rainbow colored paper students will then draw circles to represent the partners of 10. 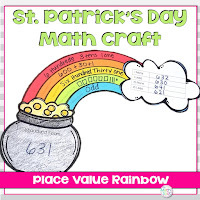 Tape or glue the strips onto a page of white paper and add a pot of gold to complete the craft. Create a quick and fun sorting activity. Draw and color a rainbow with 2 pots of gold. 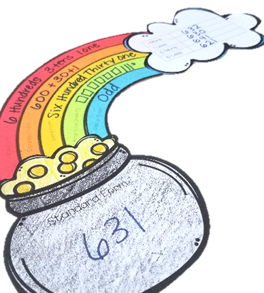 Write a fraction on each pot of gold. 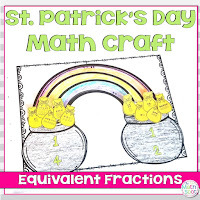 Use yellow paper to create little "gold pouches" on each pouch, students will write fractions equivalent to the fractions written on the pots of gold. If you are looking for a QUICK way to introduce any of these activities to your students, I have created templates and planning pages. A quick "print and go" will have your students engaged and ready to go! 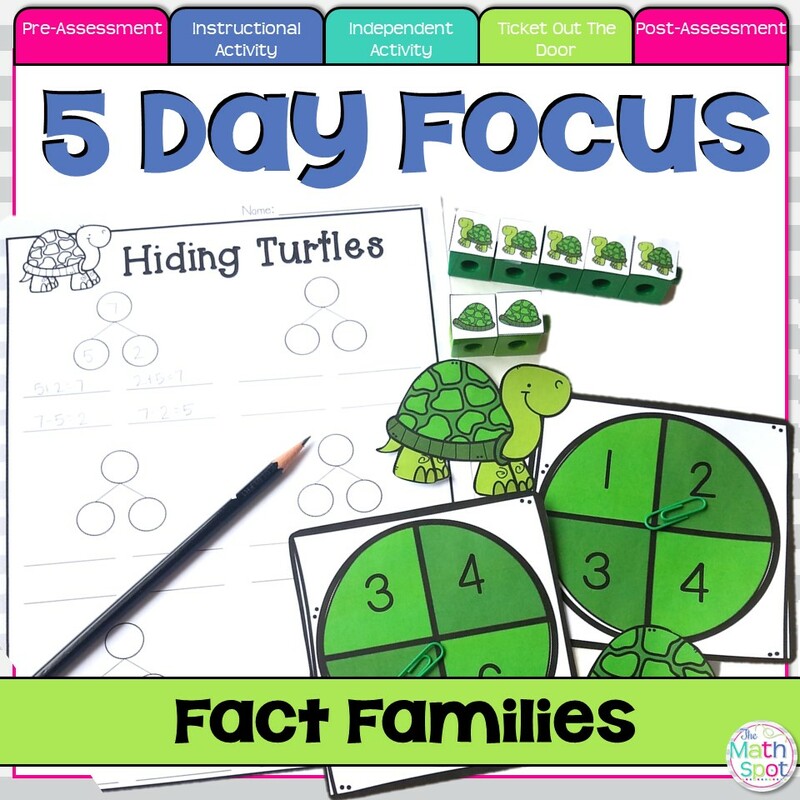 In first grade, students use addition and subtraction fact families to understand the relationship between addition and subtraction but also to become more fluent in addition and subtraction facts. 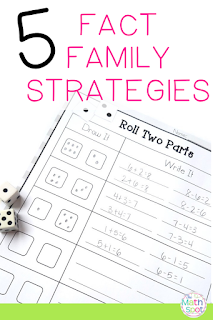 Taking a CRA (Concrete-Representative-Abstract) approach can help students to understand and generate related facts and addition and subtraction fact families. 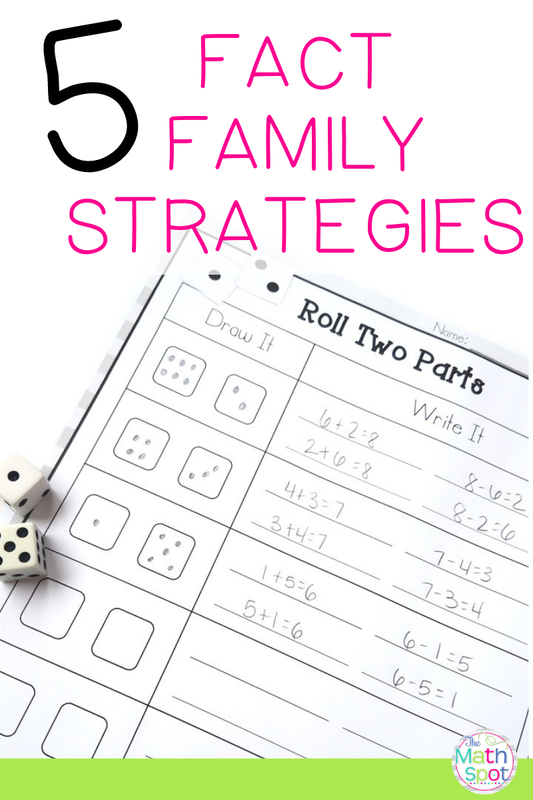 This post will outline 5 strategies that you can use to have your students practice addition and subtraction fact families. Allow students to use a material such as linking cubes that they can physically put together and take apart to generate the 4 related facts. In this example I added pictures of turtles and turtle shells to the blocks so that there is a context around the number as well. While students are using the hands on materials, I am also asking them to put their numbers into a number bond. This will help to take away the hands on scaffold further down the line! A material such as red and yellow disks is another concrete tool that can be useful for your students. The difference between the linking cubes with pictures and red and yellow disks is that the disks lack a story context making them a bit trickier to work with for students. Even if you opt to use linking cubes without the attached pictures, it is useful to use another concrete tool in another lesson so that students can begin to generalize what they are noticing about putting parts together and taking them apart to generate related equations. Taking a step away from concrete materials, dice are a great representative tool. By using dice students can still see both parts that they are manipulating. They can still push them together and pull them apart to simulate the action associated with addition and subtraction number sentences, however, they are no longer manipulating each individual unit. In this case I did not pair the activity with a number bond in an effort to begin to decrease a student's reliance on that tool at all times to generate related equations but you certainly could! In strategy number 4 I am taking away all visual cues aside from a number bond. At this point students are working with numbers in a number bond but they don't have any tool to manipulate the parts that are being put together and taken apart. Strategy number 5 is not so much of a strategy. At this point, if students have worked away from needing a hands on tool or visualization, they should be able to independently generate related addition and subtraction word problems. In this example I have students play a game where each student comes up with a number 1-10 and writes that number in their candy bag. Students then show one another their numbers and write addition sentences combining their bags of candy and subtraction sentences breaking their bags back apart. I love this partner game because students can work independently to generate their fact families and then use math vocabulary to defend their responses and check their work. 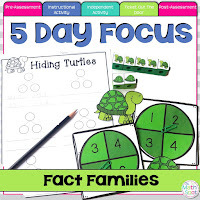 Each of these activities are included in this 5 Day Focus small group math resource. If you work with tier 2 or tier 3 students, this is a must have to add to your collection! I have included a pre and post assessment, detailed lessons, independent practice activities and daily progress monitoring.